Villa UJV 180, also known as Villa C'est Ma Vue has three bedrooms, three bathrooms and a heated pool. 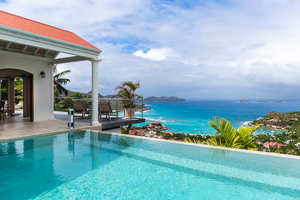 Ideally located on St Jean hillside, villa UJV 180 offers an amazing view over the Bay of St Jean and surrounding islands. Villa UJV 180 was built on different levels. The main level features the living room, dining room and kitchen, all of which open onto the pool terrace and spectacular view. The air-conditioned living room is tastefully decorated and features a polished wood floor. Movie-lover's will be excited to find a projector and screen in the living room.. Up a few steps you will find the master bedroom, which also offers a wonderful ocean view and modern amenities. Two lower-level, guest King bedrooms can be accessed via the exerior. Each bedroom is comfortable, and offers modern amenities ,as well as a private terrace with views over the bay. The pool terrace has great sun exposure and gentle ocean breezes due to its location high up on the hillside. Villa UJV 180 is ideal as it is located close to St Jean Beach, shops and restaurants. It is perfect for people who are looking for comfort and high-quality standards.